Protective Mothers Alliance International(PMA INTL). is an international protective mother-driven organization that includes a global network of like-minded organizations working as a team for positive change. 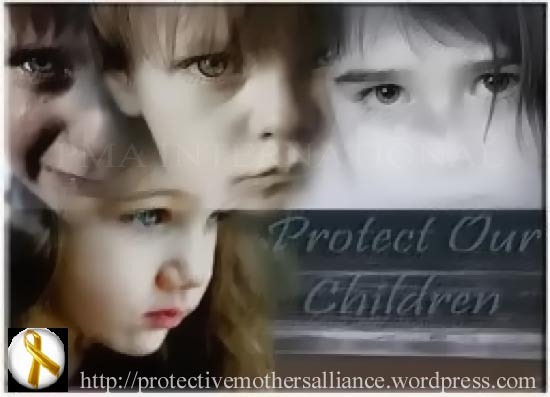 Protective Mothers Alliance International (PMA) is co founded by Lundy Bancroft and Janice Levinson, with Janice Levinson as Executive Director. The PMA INTL family consists of protective mother-driven advocates working together as a tight team for change. PMA INTL is working toward bringing about dramatic reform in family court for protective mothers and their children. PMA INTL. advocates for change through education, community and media outreach and other creative strategies that may be effective and beneficial. PMA INTL. supports the efforts of protective mothers in keeping themselves and their children safe from the abuse of a former partner, and in empowering these mothers to become advocates for themselves and others. PMA INTL. has several networks/groups including but not limited to: Man Up for Moms ((M.U.M), Hear us NOW!! 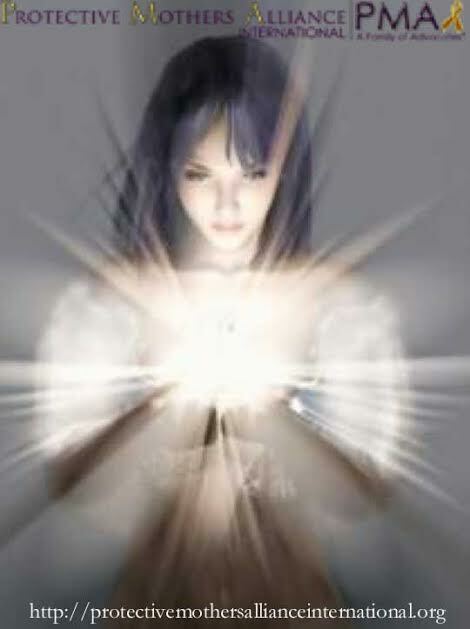 ( H.U.N) Healing and Prayer, STOP DV by Proxy. PMA’s very successful blog talk radio shows had over 6 thousand listeners. PMA INTl’s blog entitled: “The Guardian of Truth” continues to be an effective vehicle for education about family court abuse. Protective Mothers Alliance International has launched a gold ribbon campaign in an effort to reunite protective mothers and their children who have been separated by the family court.We invite all advocates and their allies around the globe to wear gold ribbons, to symbolize the effort that protective mothers and their allies are making to reunite children with their moms. PMA International’s specialty is working with abused mothers and their children who are dealing with family court injustice. This does not mean that we have an agenda against men, or that we are anti-father or that we are blind to the fact that some women and mothers can be abusers too. When Janice Levinson and Lundy Bancroft created PMA International, there were many groups helping fathers but very few helping abused mothers in family court. Janice and Lundy created PMA International to be an organization that consists of volunteer protective mothers because they saw a need, and decided to step up and help abused mothers and their children. Creating an organization of protective mothers who advocate for positive change in family court also speaks to both Lundy and Janice’s background, expertise and personal experiences. Because PMA International is a group of protective mothers and because of our vast collective experience with family court, DV, and personality disorder issues, we are very specialized in the work we do. 1. PMA International, what we do and do not do. From this point forward we will still try our best to answer all questions. But because of the great volume of e mails and messages we receive we can no longer guarantee questions asked that have already been answered on this official PMA International website/ blog or on our official PMA International FB page will also be answered through e mail or Face book. If you contact us via email and/or Face book , and do not receive a response, chances are your question has already been answered on our website/ blog and/or our official FB page. Please carefully read this website/ blog and FB page to learn more about PMA International. Thank you for your understanding in this matter. PMA International is an advocacy organization. We Do Not Get Involved In Personal Custody Cases In Any Capacity and cannot give advice/ legal advice, on personal custody cases, as we are not attorneys. Since Family Court is a legal matter, you need a legal professional to adequately and legally represent and give guidance on your personal case. There are many reasons why PMA International does not give advice on your personal custody case. Most importantly, if you have a good attorney that you trust, he/ she knows the specifics of your case in ways we could not. Your best and most accurate advice ( legal or practical) tailored to your specific situation would come from your attorney. We would be reluctant to give advice that may unintentionally lead you down the wrong path since we do not have all the information necessary or the legal expertise to responsibly give said advice. If you do not have the funds for an attorney , we recommend researching legal aid or paralegals in your area. Many DV shelters and womens resource centers offer such referrals. You may also represent yourself, but we suggest including a legal professional as a consultant. Due to the sensitive nature of the work that we do, PMA has a professional security team and a small group of attorney’s who protect our organization and our protective mothers/advocates. 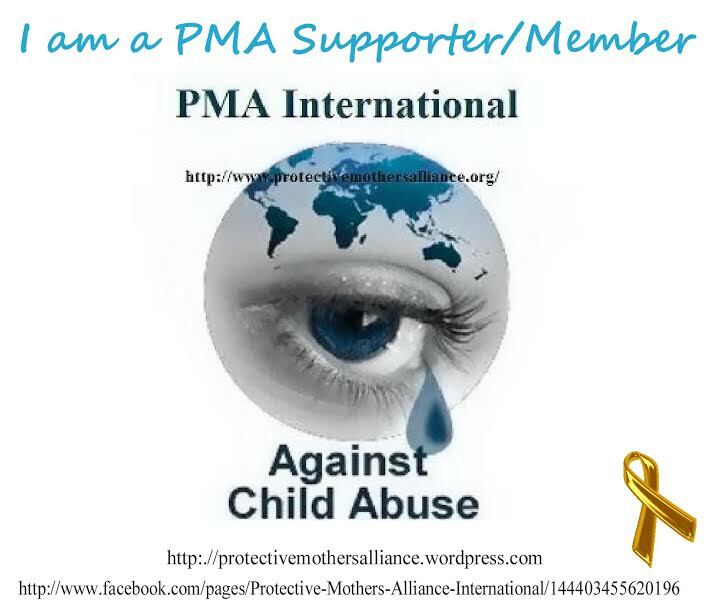 PMA International is an advocacy organization, NOT a service organization for protective mothers, at this time. Since we are not a service organization, we do not offer on site, local protective mothers’ support groups, or crisis intervention hot lines. We suggest moms research low cost professional counselors in their area or specialists in PTSD, trauma and DV counseling. In our experience, protective mothers have better results turning to professionals, educated, trained and licensed in this specialty, for healing as opposed to fellow protective mothers who are equally in need of healing / support and are not educated or trained in the above. If you are feeling overwhelmed and need emotional support, we suggest you contact The National Domestic Violence Hotline open 24 hours and staffed with trained personnel in crisis intervention and emotional support- 1 800 799 7233.
leaders, go through an extensive security check by our security team. Please note; the safety of PMA International’s protective mother/advocates and their children is our priority. PMA International always has safety as our leading priority. In light of this, PMA international will not release personal information and/or personal custody information about protective mothers and their children who are in active litigation. PMA International will not sponsor, endorse or support any event or activity that is engaging in the above due to the risk involved. PMA International advises protective mothers to be extremely cautious in revealing any personal custody details along with personal information about themselves and their children on the internet. Doing so, might prove to be very risky to you and your children’s personal safety and the outcome of your case. Please read the below link for suggestions on using the internet safely while advocating for your personal custody case. PMA International is an advocacy organization and we are not trying to discourage you from advocating for your personal custody case. 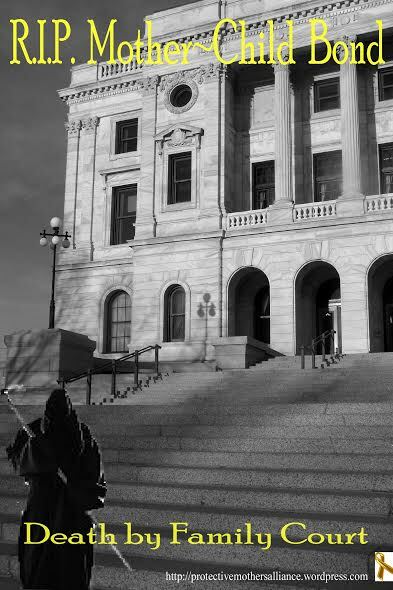 We support protective mothers advocating for themselves in smart, safe and creative ways , while in active litigation , as to not endanger themselves, their children and risk the outcome of their case. PMA International reserves the right to use all personal experiences ,quotes, and stories shared in the comment sections on this website/blog or our face book page for our campaigns. You and your child/children’s identity will be protected. We reserve the right to edit or delete any comment on all PMA International venues as we see fit. We reserve the right to block any user for violating our “no abuse zone” policy or for any other reason as we see fit. As we are also group of protective mothers any comments including but not limited to- name calling, verbal cruelty, threatening comments or critical false accusations made not only to fellow members on our FB page or this website/blog but also to our organization , ED administrators and/orleaders would also violate our “no abuse zone “ policy and will not be tolerated. The poster of a comment doing the above will be banned from this site, our FB page and all PMA International venues. Any concern , complaints, questions or issues involving PMA International and/or our members, ED, administrators ,or leaders will be communicated to us in a professional and kind manner through our pages’s FB messaging- not in the comment section on our page, or through email via Gayle Summer PMA International’s Executive Administrative Assistant @GayleSummer@gmail.com. Each concern is taken seriously and will be professionally and promptly addressed with respect , compassion, sensitivity and in a safe manner. Your identity will always be protected. Anyone violating this request will be banned from this site, our FB page and all PMA International venues. As always , all communication with PMA International or with fellow members on all our venues will adhere to our “no abuse zone “ policy. The sharing by PMA International of a post, video or meme from another site, on any PMA International’s venues or events does not indicate PMA International’s endorsement of said site or alignment with said site’s philosophy or mission statement. You alone are responsibly for the protection of your identity along with the protection of the identity of your minor child while using this site. PMA Intl assumes no responsibility for the protection of your identity and/or safety and the identity and/or safety of your minor child/ children. We reserve the right to edit all posts for any reason. PMA International reserves all copyright, trademark, patent, intellectual and other property rights in the information contained in PMA International’s “Unstoppable Mothers Campaign.” and ” Love Letters For Our Children Campaign”This includes but is not limited to, all PMA International and PMA International’s “Unstoppable Mothers’ and” Love Letters To Our Children” specific logos and services logos and no express or implied license is granted in respect thereof. Any unauthorized access, use or reproduction of the information or proprietary rights contained in this site about these campaigns is strictly prohibited and is subject to such action as provided in applicable laws. No information on this PMA International’s “Unstoppable Mothers Campaign” and ” Love Letters For Our Children ” Campaign should be reproduced or distributed for another organization’s or individual’s campaign or advocacy use, without the prior written consent of PMA International. The Information is for your personal use only. Any unauthorized copying or modification of trade-marks and/or the contents of the PMA International “Unstoppable Mothers “Campaign and ” Love Letters To Our Children” Campaign for another organization’s or individual’s use, including but not limited to, art, art exhibits, all manner of advocacy, written materials,and all manner of social media may be a violation of any law that may apply to trade-marks and/or copyrights and could subject the copier to legal action. Images and links from all PMA International venues , including but not limited to this website/blog and all PMA International campaigns including but not limited to ” Love Letters To Our Children” and ” Unstoppable Mothers” may be used only in a social media/blog content and only when provided that full and clear credit is given to PMA International and said campaigns with appropriate and specific directions to original content. Please be advised; The link below describes the only official, revised and updated, guidelines for joining PMA International. Any additional postings on any other site about this issue is outdated, null and void, and does not apply. For a list of professional services for protective mothers dealing with family court abuse and corruption, please visit the link below. Please note the disclaimer on that page. Thank you in advance for your understanding and cooperation in these matters. 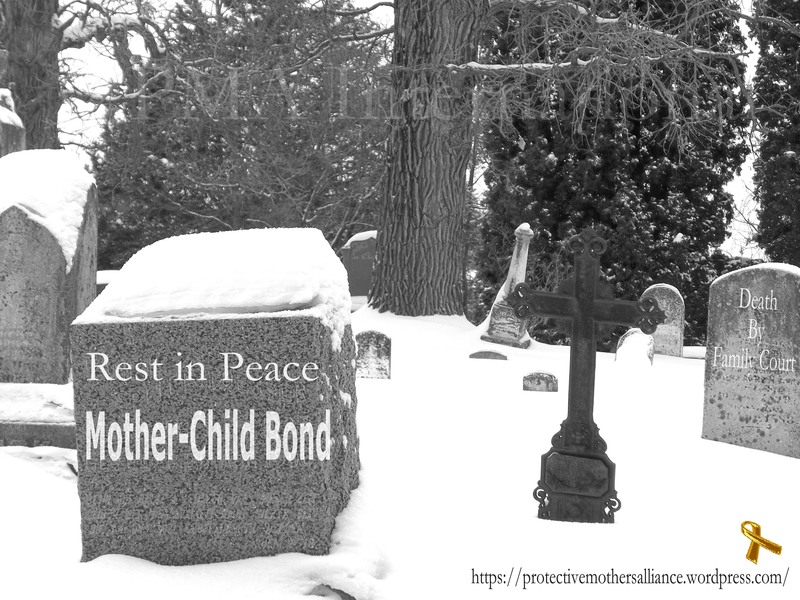 Protective Mother and Child Reunion: Gold Ribbon Campaign, Bring Our Children Home! PMA International is promoting our ongoing Gold Ribbon Campaign in an effort to reunite protective mothers and their children who have been separated by the family courts. We encourage all advocates and their allies around the globe to wear gold ribbons, to add gold ribbons to your social networking profile picture, to display a gold ribbon on your car or any other method you are legally able to do so. This is to symbolize the effort that protective mothers and their allies are making to reunite children with their protective moms. Together we can raise awareness and make a difference. Much love PMA International. You may also contact Gayle Summer PMA International’s Executive Administrative Assistant @ gaylesummer@gmail.com. PMA INTL wants to be very clear that other protective mothers are being targeted for abuse by the same individuals targeting PMA INTL. This is NOT just about PMA INTL but about protecting all protective mothers from abusive advocates within the Mothers’ Movement. PMA INTL wants to be very clear that there is no” bickering, ” “in fighting”,” arguing” “war” or any other word that might imply mutuality about this AMPP issue. This is a common misconception about this sad situation. This is a very clear case of abuser and target This is the epitome of cyber bullying. PMA never responds in kind to these attacks, PMA in no way initiates these attacks. Understand these attacks have been going on for four years. PMA does not create hate sights targeting protective mothers for abuse. Abusers wishing to escape responsibility for the abuse perpetrated on their victim put out this misleading language. Has PMA RESPONDED a few times to defend and correct the libel put forth? Yes, we have; a few times. But for the large part we have remained silent on the issue and there is no proof of us responding in kind. This is a VERY IMPORTANT distinction that must be made. Also; because of PMA’s no abuse zone policy we do not work with abusers. This is why we do not work with AMPP and supporters/ colleagues We are in a movement FIGHTING abuse,( all forms of abuse) not CONDONING it.You cannot “negotiate” with an abuser, you cannot “bridge the gap” with an abuser; Moms have you tried to do this with your exes? How did this work out for you? We must be careful not to use the same language and mind set about the dynamics of abuser and victim as the family courts have used on us to excuse the abuse and the abuser. We must be careful not to victim blame. We must not be hypocrites as our credibility depends on us ” walking our talk” As moms we have already experienced this victim blaming with our abuser exes and family court. We must learn from our experiences and not continue the pattern and the cycle of abuse. Hearing an accusation about PMA, Janice or Lundy ? ASK THE ACCUSER FOR PROOF if you want to know the truth. Please do not accuse anyone without proof. Gossip is dangerous. Currently, several Protective Mothers are being abused ( not just PMA), with libel and cyber bullying. Some “advocates” in the movement are supporting the abusers by promoting and working with them , staying silent, victim blaming, excusing their abuse, attempting to silence victim’s voices and more. Please stand up for what is right. Do not stay silent ASK FOR PROOF. 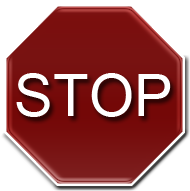 Tell the abuser to stop!!! Hold abusers accountable. Help protective moms from being re-victimized. If you are a new protective mom looking to join a group be very very cautious, as certain advocates and groups may not be what they appear to be. 1. Look for a no abuse zone policy posted on their website. But look for PROOF of adherence to this policy by investigating the contents of their past posts. If you do not see proof of above be cautious in believing their rhetoric and be very cautious in giving out your personal info to them.A little bit of work in looking back on the advocates/ groups’ history of posts on the internet can go a long way in protecting yourself, your family court case, and your children along with keeping you and your family safe. 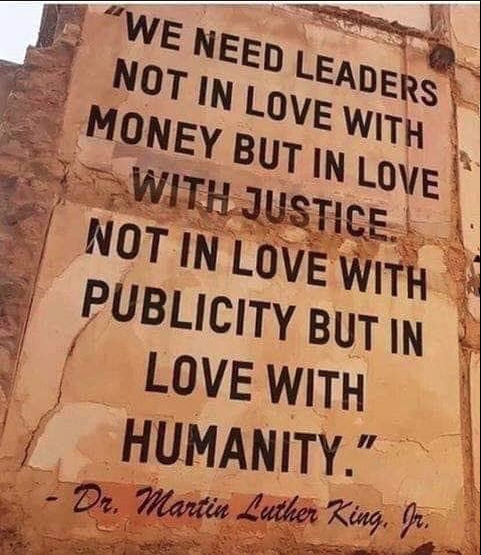 Let’s treat each other with kindness, respect and love. Protective Mothers’ have been through so much. Best to you all, and Thank you for your support. Stay safe.